Coming on in the eighth inning of this June 1993 game for AA Shreveport, Rich Simon had a bit of a challenge: Runners on second and third and a one-run lead to protect. Simon responded by striking out the next batter looking and then set down all three Tulsa batters in the ninth to record the save, according to The Tulsa World. Simon recorded that save for Shreveport - one of his 26 on the year - in his eighth pro season. He'd seen time briefly at AAA the previous year. He'd play one more season, but he never made the majors. Simon's career began in 1986, taken by the Astros in the ninth round of the draft out of St. Francis University in Brooklyn. Simon is also referred to as Richie Simon. Simon started with the Astros at short-season Auburn. He went 4-6 in 15 starts. He returned there for 1987, also getting time at single-A Osceola. 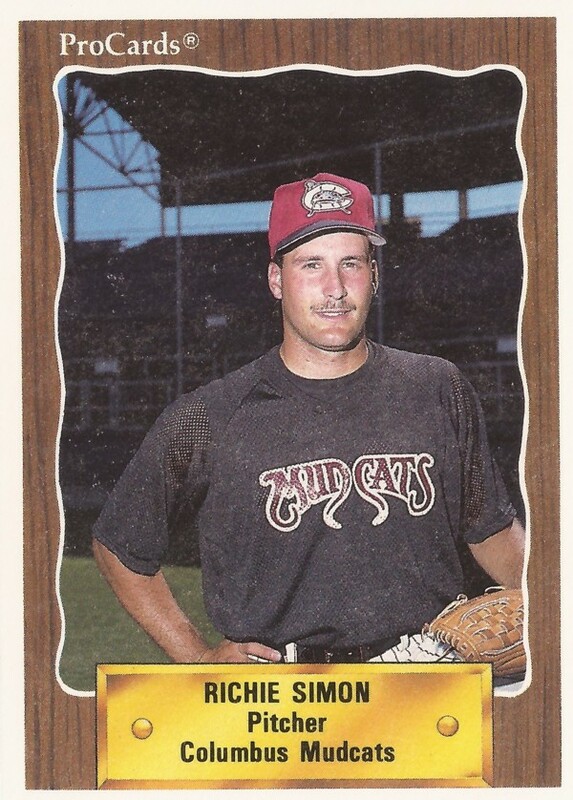 Simon continued as a starter through 1989, playing at both Osceola and single-A Asheville. He went 9-9 at Asheville in 1988, picking up one of his losses in a May game where he gave up five runs over 8.2 innings of work. He then went 6-8 at Osceola in 1989. Simon then moved to relief. He got into 49 games in 1990 at AA Columbus, with a 3.32 ERA. He then played 1991 at AA Jackson, turning closer. He saved 20 games for the Generals that year. In 1992, Simon got his first and only look at AAA Tucson. In nine relief appearances, he lost one game and saved another. He played the rest of the year back at Jackson. Simon moved to the Giants system for 1993, playing at Shreveport that year and the next. He got into 52 games, saving his 26 in 1993. Simon returned for another 26 games in 1993, posting a 4.29 ERA to end his career.